As seniors at Environmental Charter High School (ECS) in Lawndale, California we would like to share our story and impressions of attending a school with a focus on environmental studies. We believe that the lessons we learn will have a lasting impact on our lives. The hands-on field work that we do outside of the classroom has helped us embrace the fact that we are one with the earth. The curriculum at ECS has opened our eyes to the vast array of problems humans have created, but has also taught us the importance of giving back to our community. Believe it or not, being an environmentalist isn’t just about recycling and picking up trash from beaches. It runs way deeper than that. It’s about sustainability, interconnectedness, and actually learning how systems work in relation to other systems. At ECS, we don’t just see the problem. We see the cause, the effects, and the solution. Once we think of a solution we go out into our communities and we implement the solution. We aren’t just making change, we are the change. As Green Ambassadors Interns, we get to work with community organizations doing countless service learning projects. Most recently we worked with the U.S. Green Building Council to become LEED Green Associates. With our fellow interns, we took a two week summer course related to LEED buildings and certification. We then took a test and passed! We are some of the youngest people in the country to be accredited as LEED Green Associates. This certification demonstrates that we have a basic understanding of sustainability and how the built environment contributes to global climate change. Being a LEED Green Associate has definitely helped us in our work with sustainability audits. Local companies reach out to Green Ambassadors student interns for help on how to become more sustainable and environmentally conscious. We create a checklist and then audit the company. We discuss what the company is doing well and what they can improve. After a month of research we come back to the company to present our findings and recommendations to the CEO and heads of each department. Some companies are trying to attain LEED certification for their building, and the Green Associates can help with that process. This project has shown us how business can be sustainable and that consumers want sustainable products. Most importantly, attending ECS has provided us with experiences we never knew we could partake in, and allowed us to fight for the issues that make our community a better place to live. In addition to the sustainability audits described above, we have completed trail work on the Pacific Crest Trail and have gone to Washington, DC to speak with members of Congress about environmental justice and the importance of people of color engaging in environmentalism. Closer to home, we are building rain gardens with SpaceX in our community. This may not sound like much, but our neighborhood is within one mile of LAX and our school is next to one of the busiest freeways in Los Angeles. In this neighborhood, any type of greenery that will combat smog is a big help. We are also creating a program that will allow children and families from our community to experience green spaces and public land, so that more people of color develop a relationship with the natural world and understand the array of STEM careers available to them. We believe that green schools have the potential to shape our nation’s future leaders. ECS pushes us to focus on innovation, and how we can make things better. Our teachers call attention to things people are too afraid to address. What we learn in school is what we see in the world. The problems we are learning about in class are the problems we face everyday. 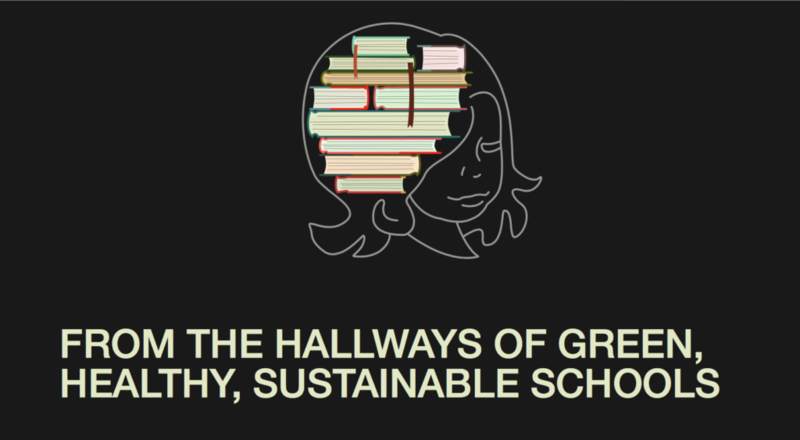 We represent the kinds of citizen scholars that great green schools graduate. Without going to a green school, we would never have had these amazing opportunities, and that’s why green education is important. Carolyn Lam is a senior at Environmental Charter High School and the most recent recipient of South Coast Air Quality Management District’s ‘Youth Leadership in Air Quality’ Award for writing her senior thesis on climate change and air quality in low income communities. She is an accredited LEED Green Associate and plans to study architecture and environmental engineering. She likes to examine issues from a social justice perspective to bridge the gap between people and science. She is passionate about social and environmental issues and hopes to inspire others to create change. Ogechi Hubert is a Nigerian American senior at Environmental Charter High School. She has flown to Washington, D.C. with the Pacific Crest Trail Association to speak with Congress about the lack of people of color in environmentalism, which is her senior thesis topic. She went on to partner with the Sierra Club to provide buses for students of color to visit local green spaces. She has also been published in the Pacific Crest Trail Communicator, is an accredited LEED Green Associate, and plans to intern with Congresswoman Maxine Waters. About Environmental Charter Schools Environmental Charter Schools (ECS) is an innovative network of free public schools serving South Los Angeles. Founded in 2001, ECS is comprised of a high school and two middle schools, and serves more than 1,000 students each year. The mission of ECS is to create and deliver vibrant, innovative, interdisciplinary learning opportunities using the environment to engage students and connect them to the wider world. Our vision is that students are equipped with the knowledge and skills to graduate from college, inspired to discover their own sense of purpose, and empowered to become quality stewards of their own communities. And ECS achieves that. While the neighborhoods served by ECS have crime rates that are twice that of the national average, low levels of educational attainment, and high levels of poverty, ECS students live a markedly different story- they reach their academic potential. 98% of ECS high school graduates have completed the coursework needed to apply to a 4-year college or university. In 2015, 97% of its graduates were admitted. Most ECS graduates – who are predominantly first and second-generation immigrant youth of color – are the first in their families to go to college.